The remote location and inclement weather make the destination difficult to get to, but the rugged landscape, endless fjords & friendly people make the Faroes a must see. If hotels are more your scene, check out Hotel Foroyar, which boasts fantastic views of Tórshavn and has excellent reviews. Fan of Scandinavian architecture? Be sure to visit Tórshavn Cathedral and the surrounding streets. The Cathedral was established in 1788 and is a great vantage point for viewing the harbour and town. For those interested in history, a stop by Tinganes is a must when exploring Tórshavn. The Vikings established their parliament here in 850, making it one of the oldest parliamentary meeting places in the world. If you are looking for chic and warm sweaters, look no further than Guðrun&Guðrun. The stunning sweaters are produced with Faroese wool by local women in the Faroe Islands, Peru & Jordan. One of the greatest parts of exploring Tórshavn is discovering the local art. One artist that stood out for me was Jon Magnus Joensen. His paintings are bright, whimsical, and seem to capture the wildness and uncertainty of the Faroe Islands. If you’re a fan of pottery, pretty pastels, and clever designs, be sure to stop by No 10. It’s the perfect place to find a statement piece for your home or a creative souvenir. For the perfect Faroese Lamb, try Aarstova. The restaurant is well known for both their lamb and their large portions. Be sure to read the beginning of the menu, which contains many interesting facts about the restaurant and history of its building. A trip to the Faroe Islands is not complete until you try the fish! Barbara offers a variety of plates to share. The ocean perch entree and smoked salmon appetizer were both excellent. Kaffihusid is a great cafe to stop by for breakfast or an afternoon coffee. The atmosphere and service are great. Want to grab a quick pint during your time in Tórshavn? Be sure to stop by the quaint Cafe Natur, conveniently located near the Harbour and across the street from Barbara and Aarstova. The airport is located about a 40 minute drive away from Tórshavn. Cabs, rental cars, and buses are all viable options for getting to the town. Within Tórshavn itself, it’s easy to explore by foot or by the free city buses. Gjógv is a charming village located in the North East of the Faroe Islands. The village is aptly named for a large gorge just north of the village. If you do make it to Gjógv, the Gjaargardur Guesthouse is an excellent place to stop for lunch! On the drive back to Tórshavn a stop in Saksun is a great addition to the trip. 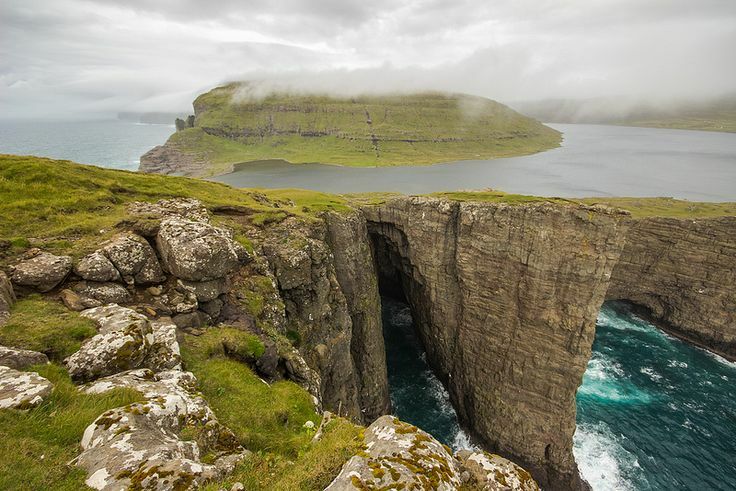 One of the most photographed sites in the Faroe Islands is of a waterfall pouring into the ocean. The hike from the edge of a lake to the falls is about an hour & well worth the Instagram!